Quinoa Burgers, Chicken Fingers and Roasted Corn on the Cob! Last night, the boys wanted chicken fingers. I little while back, I got some Kinnikinnick Panko Style bread crumbs. I knew right away what I would be making with them. The illustrator is a good 'ol Southern boy and he has dearly missed his fried chicken since being diagnosed with celiac disease. Well, I don't typically fry things. Call me a health nut...I don't care, but I will come up with another alternative to frying any day! 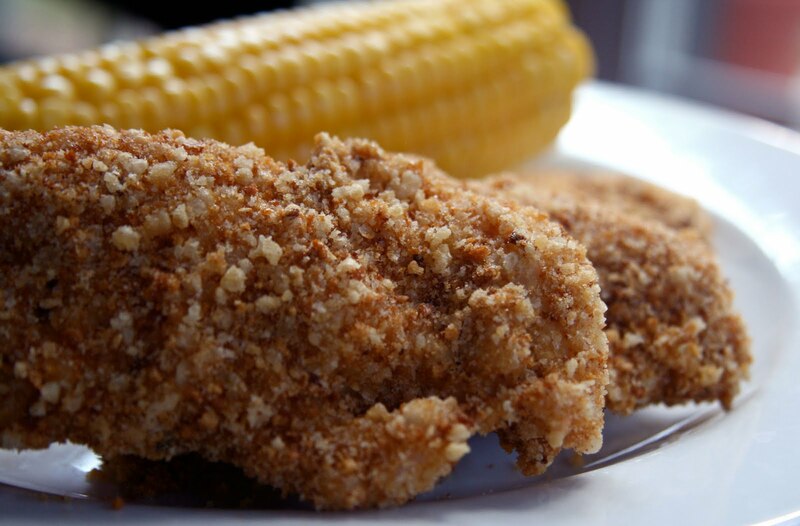 So, breaded baked chicken fingers it is! Trust me, one bite of these bread crumbs and there was no complaining! Honestly, I have never heard all three of my boys speak so highly of breaded chicken like this! They absolutely love it. In fact, the illustrator has already asked me when we are getting more of "those" bread crumbs. The boys had the chicken fingers for leftovers today and even after being microwaved, the bread crumbs were still crispy! I used the directions on the box and it works perfectly. I will definitely be buying these again! Since I don't eat meat, I decided to use them in some bean burgers for myself. 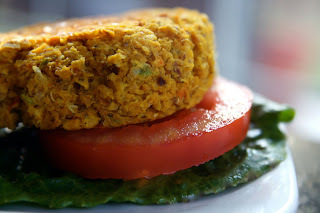 I don't know if you know this about me, but I love making bean burgers! I never buy them, and with my handy pressure cooker, I always have beans on hand. I cooked up a mess of quinoa the other night and was trying to think of something to do with the rest of it. I had made burgers with it before, but they just did not hold up to my standards for a good burger. I hate when they crumble and fall apart. It totally ruins the experience for me. I like a crispy outside and I want the inside to have some texture (not be mush). So, last night I took out my original recipe, changed it up a bit and added Kinnikinnick Panko Style bread crumbs. I used chickpeas in the mix and while rummaging through the herbs and spices...I picked turmeric. I love that stuff, especially with chickpeas! The bread crumbs were the perfect addition! I made little patties and they were perfect for my little sliders! The illustrator loved them too! I loved the crisp texture the bread crumbs gave them...perfect! For the side dish, since it was on sale at the store, I oven roasted corn on the cob! I discovered my love of raw corn last summer. I love crisp sweet corn! I hate when corn is cooked to death...it is just gross! I am also a purist with my corn. 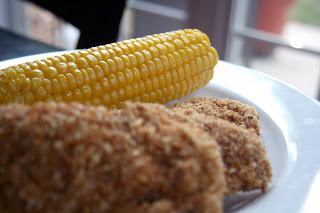 I cleaned the corn, roasted it and put a little salt and pepper on it when it was done...I am so ready for summer food! Preheat your oven to 375 degrees. Clean your corn and put it on a broiling pan. Bake for 15 minutes, turn and bake for 10 more minutes. Now turn your broiler on and broil the corn for 5-10 minutes or until it is done to your liking. Make sure you watch it so it does not burn...unless you like it that way! 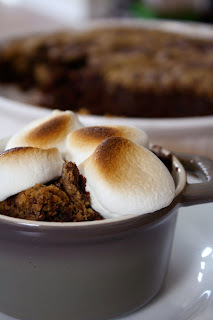 Don't forget I used Kinnikinni graham cracker crumbs in the smore's brownies! You have to check these out! I never would have thought they made gluten-free bread crumbs! Awesome! I'll prefer baked breaded over fried anyday, too. Not only do I prefer not tasting sopping oil - but it's just better & easier, anyway :P Tonight I wanted eggplant parm - but rather than turn on the oven was able to still get it nice and crispy by just doing a pan-fry in a non-stick fan that was lightly sprayed with olive oil. Worked fine!! I loveee homemade veggie burgers. I went through a phase where I'd think buying them was a good idea for a quick meal. Uh, no - lets just say the box would get chucked after a bite. Way easier and BETTER to just make my own and freeze!! 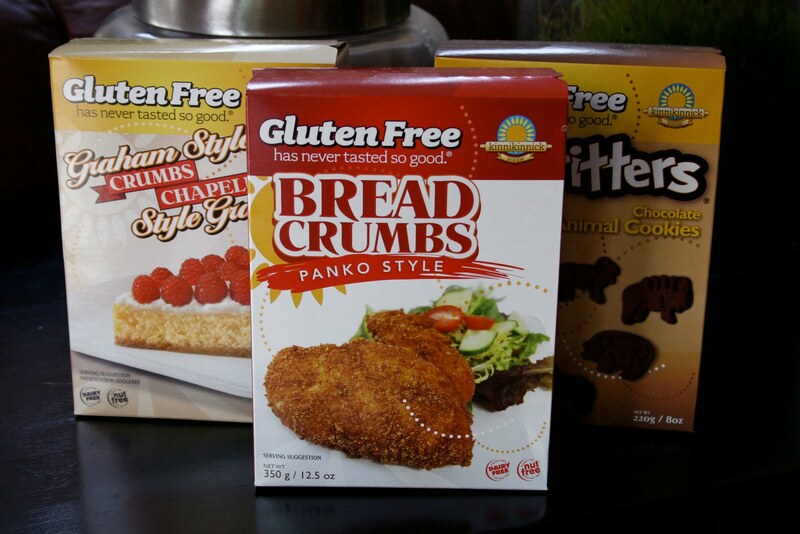 I had no idea gluten free bread crumbs and graham crackers exist!!! Thanks for sharing! Everything looks awesome - I don't know which I would have picked the chicken fingers or the bean burgers!! Quinoa burgers look amazing. I didn't see a recipe? those smores!! yum! the kinni brand, have heard great things bout them but no first hand experience. loved your comment tonite about what you've been thru from past to present with your body, health, etc. I never fry things either! I make a lot of stuff from ED&BV/Veganomicon and it always tells me to "pan fry" in which I spray a layer of cooking spray and plop it on there lol. I don't see it necessary to add a ton of oil. You only need a little to carry the flavor + texture! wow, I'm so impressed! Everything looks like it turned out perfectly! I never fry things either...baking is the way to go for sure!! Everything looks delicious!! I haven't tried the panko crumbs yet, but I always see them in whole foods. Next time I go there I'll have to get some to try because they look so good and crunchy! I'll have to try them like you did. Those patties look delectable. I've been looking for vegetarian alternatives to burgers and those look like they'd work nicely on the menu. Thanks!